After what has been an underwhelming 2005 for me thus far, I am very pleased to discuss the new Starbreaker album. The main forces behind this band (I hope this is a band, not just a one time project) are Magnus Karlsson of Last Tribe and Tony Harnell of TNT. As is natural to do, this band will draw comparisons to TNT simply because Harnell fronts both bands. Simply put, Starbreaker is a significant departure in style from Harnell's other bands, TNT and Westworld. Well, if I were forced to compare this album to something of Harnell's part works, it would be TNT on steroids! The heavy European hard rock / melodic metal hybrid of music found on this album parallel the sound of Last Tribe much more than anything Harnell has been involved with. Karlsson and Harnell have proven to me with this album that they are a fantastic musical duo. From the opening track, Die For You, it is evident that this album is the heaviest work that Tony Harnell has done in his career. Tony has released three albums with Westworld that fall somewhere between AOR and "light" hard rock. TNT's latest album, My Religion was an excellent return to form, albeit not a heavy album. This time around with Starbreaker, Harnell rises to the challenge, sounding much more aggressive on this album that he ever has before. Despite this, Tony doesn't abandon the emotional and melodic delivery he has become known for ever since TNT's Knights of the New Thunder album. To say that this is Tony's career performance might sound premature to some, but it is an easy conclusion for me. It's nice to hear Tony singing to some heavier material, he certainly has an intense enough vocal delivery to handle it. Again, he makes the most of this opportunity to show us a side of himself that the music of Westworld and TNT usually does not call for. Musically speaking, Starbreaker is bound to appeal to a wide audience; fans of hard rock all the way to melodic metal will appreciate this album. The steady dose of Kalsson's heavy, crunchy riffs and the full throttle drum work of John Macaluso will unquestionably appeal to melodic metal fans. Just a further comment on the drumming; Macaluso is relentless behind the kit. He never throws in any predictable, mechanical sounding fills. Instead, his intense style, which includes lots of double time beats, drives each of these songs home like a torpedo. I can easily see this guy going berserk during a live show, playing in front of screaming, passionate fans. There is wide use of perfectly placed (but not over abundant) keyboards that add character to the album. I find this keyboard use very similar to what Masterplan has done on both their albums. Whether it be a soft, soothing introduction to Days of Confusion, or a haunting prelude to the moody sounding Underneath a Falling Sky, the keyboards on this album have been used in the perfect way, at the perfect times throughout the album. Underneath a falling Sky ever shows a progressive side of the band with it's many keyboard textures, tempo changes, and piano fills. Of course, big riffs and one of the most TNT like hard rock choruses of the album makes this track one of the many highlights. Stylistically, the melodic metal meets melodic hard rock formula is similar to Masterplan, and to a lesser degree bands such as Axxis and PC69. There are plenty of choruses on this album that will be impossible to forget once this album is done playing. From the powerful and angry chorus of Lies and the catchy verses of Break My Bones, all the way to the intense closing track, Save Yourself, Starbreaker takes the listener on quite a journey. The riffs and guitar work in general found on this album leaves little room for complaint. Magnus Karlsson delivers catchy, driving riffs throughout the album. The bass guitar is featured at just the right level (as opposed to the 80's and early 90's when it was largely ignored for some reason) to give the songs perfect balance, and an extra hard edge. The soloing is just as energetic and flamboyant as the drumming and Tony's vocals, but Karlsson never compromises the integrity of the song for an ego building demonstration. He does indulge a bit with the instrumental Dragonfly, but one instrumental track out of twelve total is a more than acceptable ratio. As I've touched on before, the songwriting is at or even above the level that I would expect from a couple of veterans such as Harnell and Karlsson. Tony puts forth the vocal performance of his career; heavy and intense, yet just as melodic and emotional as you've ever known him to be. With flawless guitar work and ear splitting drum work, there is no shortage of intensity on this album. Well placed keyboards give the songs some character, and find a way to create just the right mood (or change moods) at just the right time. Unlike most TNT albums which feature several strong tracks, but inevitably, at least a couple of throwaway tracks, this album is a model of consistency. Each time I play this album, I listen to all 12 tracks without losing interest or skipping a single track. There are no ballads on this album, something that I always thought TNT were terrible at, so that's a good thing for me. The guys keep up the pace which fluctuates somewhere between heavy hard rock and melodic metal for the full duration. Starbreaker have a distinct talent for creating music that just infiltrates your memory, and demands to be played repeatedly. Tony helps to carry the soaring, powerful chorus lines to a higher level, while Karlsson pounds us with riff after riff. I sincerely hope that this album is one of many for Starbreaker, and not just a "project." Interesting songwriting, consistency, and superb individual performances are the fundamental qualities of a great album. Starbreaker easily possesses all these traits. Of course, fans of TNT will gravitate toward this album, but a wide group including fans of hard rock, melodic metal, and some progressive metal fans should find a lot to like with this album. 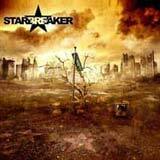 For me, Starbreaker has the early lead for my album of the year. Whatever happens during the rest of the year, look for this album to come up a lot when fans and critics begin discussing top albums of 2005 some 9 months from now.